The Hillsborough Gallery of Arts begins its Featured Artist series this year with new work by Arianna Bara, Ali Givens, and Lynn Wartski: a jeweler, a sculptor, and a fabric artist play side by side. Arianna Bara writes of her new work, "As a jeweler, stones are often the focus of what I am creating. Boulder opals, drusy quartz, labradorite, fossils and gemstones inspire me with their flashes of color and movement. I am intrigued by the stories our ancestors told about the origins of rocks and their properties. My new work incorporates many different stones into textured sterling silver settings in ways that help relay these ancient stories." 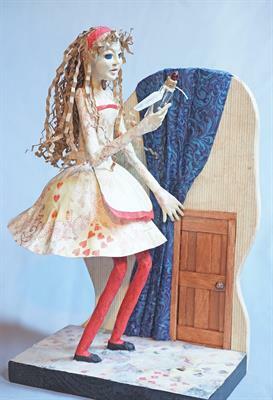 Lynn Wartski describes her process for this show, "My creative adventure with art doll sculptures continues to lead me in new and interesting directions. The media part of my mixed-media sculpture now only contains metal, when there is a metal element called for in its design. Paper has become the most prominent material. From paperclay used to sculpt faces and hands, or a tissue paper crinoline under a skirt, to inspiration drawn from the pages of all types of text media. I find myself flipping pages of books, and scouring the internet for images and illustrations that stretch the ideas I am looking to capture within a piece. I always have enjoyed incorporating small details into each art doll that the viewer will only discover on close inspection. These items pulled from text add surprises to the surfaces of the sculptures as well. Personally, I am intrigued and delighted by altered book sculptures, and I feel that my work is inching toward a fusion of art doll and altered book. One example of this blending is my latest look at the adventures of Alice in Wonderland. This sculpture looks at Alice's inspection of the small bottle labeled, "drink me", and the curiously small door she finds in the wall. Vintage playing card images adorn this figure's dress, floor of the room, and the back of the sculpture. 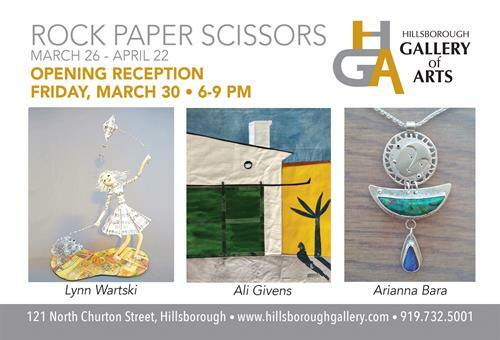 I am excited for my "paper" works to play alongside Arianna Bara's beautiful "rock" and silver jewelry designs, and the colorful "scissors" play found in Ali Givens delightful textile works." Ali Givens writes, "The fabric collages in this show depict details of things I see as I explore new places. A building, a person, a vase of flowers-- these are all subjects that I like to illustrate with fabric. Often while I wander in new places, certain things, like a hummingbird painted on an old building, are so wonderful to me that I come home and begin cutting and stitching fabric to capture my initial excitement."